Given that Crazy Fox Bistro has graced the city of Barrie with fine meals for thirty years they are entitled to high praise. 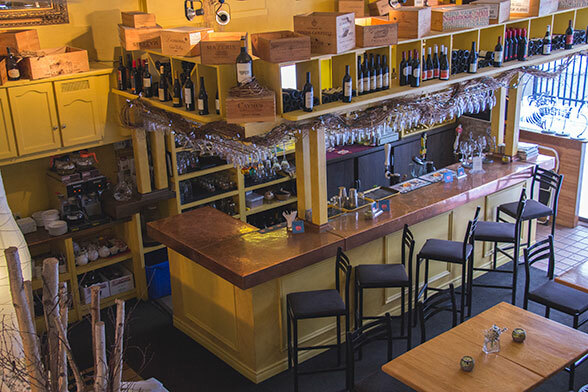 From the original location on the waterfront where now sits The Farmhouse, to their present perch on Bayfield Street overlooking the bay, Crazy Fox Bistro has a strong following of regulars and a full house of new clientele who consistently return for the great food and the professional service. Coos and Lawna Uylenbroek spent time in Stanford Connecticut where he was the Chef at a luxury hotel. Fast forward a few years, when the pull to return brought them back home to Canada. With family in Barrie, the urge to settle here was strong. The cincher was seeing how quickly this fabulous city pulled together and got back on its proverbial feet after the hurricane of 1985; they felt Barrie would be a great place to raise their family and grow their business, so they set down roots. 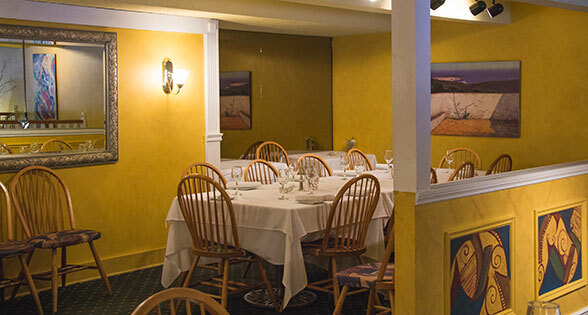 Crazy Fox Bistro exudes warmth and welcome; the glowing soft yellow walls, inspired by the owners’ love of a Californian lifestyle, a soothing soundtrack, the open kitchen, it all reaches out to customers in a most inviting fashion. White linens and generous lighting add sparkle to place settings, there is no pretense here, simply comfort and good food. Darling daughter, aka my photographer and I cozied in on a recent Friday afternoon in the midst of a wicked January snowstorm, seeking said warmth and we were not disappointed. Dinner at Crazy Fox Bistro is delightful, I have enjoyed many fine meals here, but I recently discovered that lunch is lovely too! Many of the lunch menu items stick around for the dinner hour. As owner Lawna Uylenbroek explained to me, when her husband, Head Chef Coos Uylenbroek wishes to freshen up the menu, they have many “regulars” that request certain menu items stay available. So tweaks are made, or special evening events are planned, phone calls placed to let customers know that “their” special dish will be featured. They listen to their customers at Crazy Fox Bistro and that is amazing service! 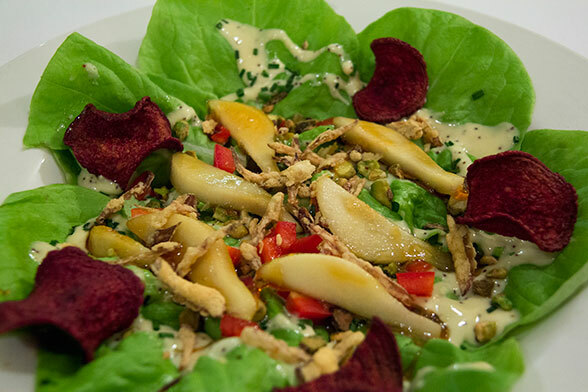 I started my lunch with the Boston Pear salad, which features caramelized warm pear, pistachios, and a poppy seed walnut oil dressing. Beet chips were a vibrant splash of colour against the snowy backdrop of the winter day, the taste was wonderful, I was partial to the crunch of the pistachios and the aforementioned chips. Darling daughter had inquired about availability of a small side Caesar salad, one of the Crazy Fox Bistro menu classics; served with lemon garlic dressing, herbed croutons, and parmesan. The kitchen was obliging and a mini version was provided for her. Our server suggested we try the “Bang Bang Shrimp”; they are served with Thai chili sauce on slaw. These are a customer fave and are on the dinner menu also. The side stripe of cilantro was a perfect accompaniment for additional dipping, cilantro and I are good friends. 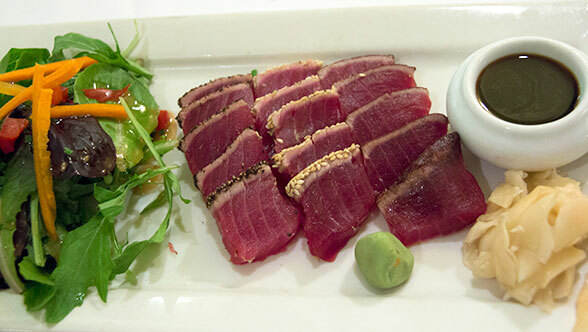 My main was “Sushi Tuna prepared three ways; Sesame, Cocoa and Crusted pepper seared”, perfect and very photogenic too! Pasta for the photographer please; “Spinach, mushroom, and goat cheese filled Agnolotti, with rose sauce, basil and parmesan”, a lovely stem of tiny perfect enoki mushrooms on top. We lingered over lunch, savoured every bite. Our most capable server highly recommended we try dessert, it was the “Cinnamon Flavoured Apple Phyllo Fold”, filled with dried cranberries and almond crumble, with a wee bit of ice cream on the side that tempted me the most. 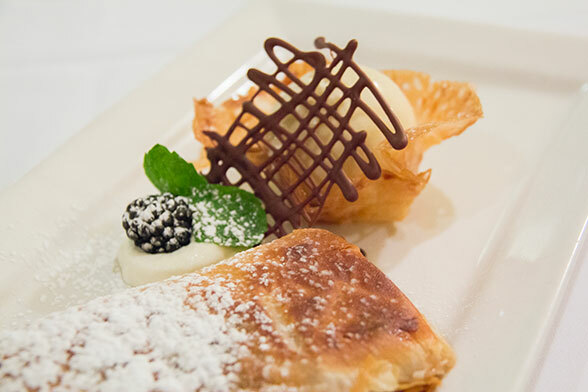 Sous Chef Michael Forget had just arrived to prep for dinner, and he graciously fired up the oven to create this delicious ending to our luncheon. We were not the only customers that enjoyed a leisurely lunch, it was delightful to while away the afternoon knowing we wouldn’t be rushed. While I didn’t imbibe, I perused the wine list; it provides a wide and thoughtful selection of vintages at various price points. The restaurant is laid out on several levels, the upper dining area is ideal for private parties, and the multi layered design works in favour for unique events. Lawna explained that small weddings are often booked at Crazy Fox Bistro, with the wedding couple taking their vows on the balcony while guests gather on the lower level. The servers have plenty of space for champagne corks to pop! 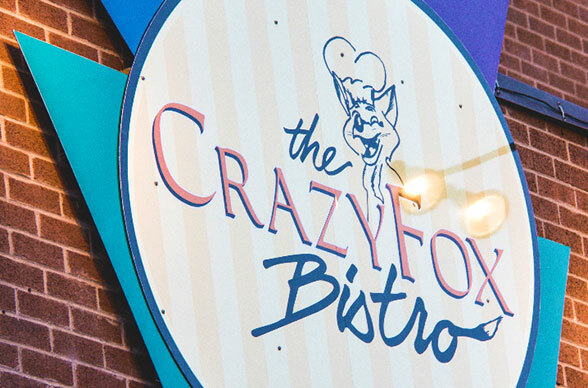 Crazy Fox Bistro participates in the twice yearly food festival that is Barrielicious; this is a great opportunity for those who may be unfamiliar with the restaurant to find a fabulous new favorite place to dine. When I asked Lawna what message she would like to share with my readers her reply was right to the point and strongly echoes my personal views about supporting local business. Crazy Fox Bistro has been a landmark restaurant in Barrie for thirty years; Lawna assures me they aren’t going anywhere. I highly recommend you make this your new favourite restaurant!